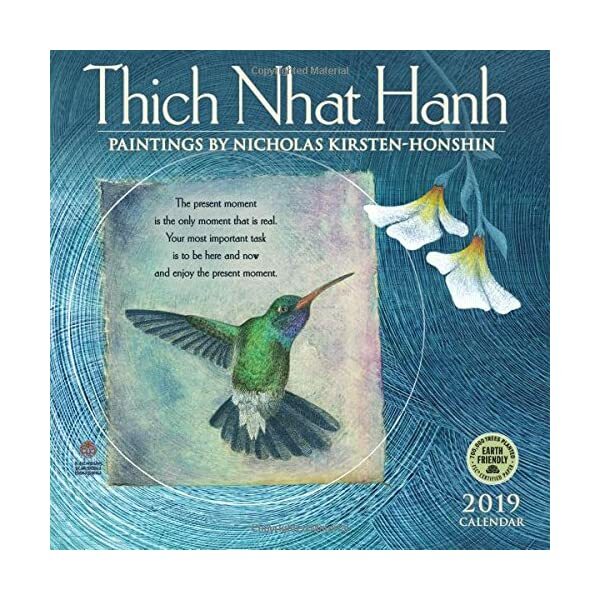 The Thich Nhat Hanh wall calendar combines Nicholas Kirsten-Honshin's meditation paintings, infused with transcendental and archetypal symbols, with the words of Thich Nhat Hanh, renowned Zen master and peace activist from Vietnam. 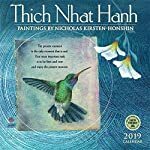 Thich Nhat Hanh's gentle wisdom will inspire and guide you on your own spiritual practice throughout the year. A year of Thich Nhat Hanh's wisdom and Honshin's stunning artwork on your wall. Zen symbols, ancient imagery, and the gentle reflection of nature meet and merge in Honshin's calming and meditative artwork. Each month features inspirational wisdom quotes by Thich Nhat Hanh. The Most Venerable Thich Nhat Hanh (Thây) founded the Unified Buddhist Church (Eglise Bouddhique Unifieé) in France in 1969, during the Vietnam war. Thich Nhat Hanh is a Vietnamese Buddhist monk, a poet, a scholar, and a peace activist. His lifelong efforts to generate peace and reconciliation moved Dr. Martin Luther King Jr. to nominate him for the Nobel Peace Prize in 1967. When not traveling the world to share The Art of Mindful Living, he teaches, writes, and gardens in Plum Village, France, a Buddhist monastery for monks and nuns and a mindfulness practice center for laypeople. Thich Nhat Hanh is the author of more than 60 books, including Peace Is Every Step, Being Peace, and Miracle of Mindfulness, published by Parallax Press, United Buddhist Church. Over the years, Thich Nhat Hanh's writings have inspired many to embark on a more peaceful and mindful path.